NIS America has released some of my more favorite strategy RPGs over the years with the Disgaea series, and now Grand Kingdom is one of those potential games. Instead of bogging down a player that wants to get into the game quickly with a long, sprawling story, it’s pretty straightforward. The player is the leader of a band of mercenaries and contracts out services to the highest bidder. When put like that, it doesn’t sound too intimidating of a game. The backstory consists of the land of Uldain being in turmoil due to four warring kingdoms, and mercenaries are trying to take advantage of it to get rich or die trying. Grand Kingdom starts off with a easy-to-pickup tutorial with your small group of four mercenaries just finishing a battle. While trying to get into the Mercenary Guild, the player is introduced to general game mechanics. Playing though missions and navigating though them is something unique from what I’ve seen. Main game movement plays out like a cross between a board game and Super Mario Bros 3 overworlds- each time your mercenary team moves, enemies will move within a pattern. Moving into an enemy piece will initiate combat. 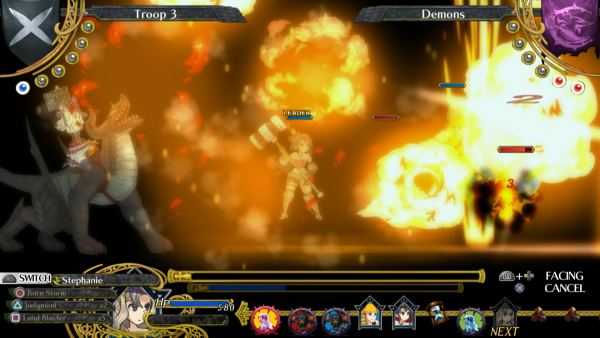 Combat is on a two dimentional plane and involves the player’s mercenaries on one side and the enemies on the other, with taking turns moving a character and setting up attacks on opponents. Depending on what the mercenary team setup is, and what their abilities are, Grand Kingdom will give a few options for abilities. For instance, Mages need to charge up spells, or healers can use Potions to throw onto team members that need healing. One major thing to keep in mind, and that’s friendly fire. If one of your own characters is in the way of an attack spell, or an enemy is in the way with a healing potion arcing down, it will affect them as well! It gives an additional layer of strategy to battles. Even though it may seem a bit complicated, battle mechanics were fairly easy to pick up. Navigating the rest of a board may involve finding treasure, hidden enemies, boss battles. In addition to that, items can be used to make things easier or to get though a mission faster. Adding another layer of strategy is a counter that counts down with each time your team moves on the mission board. At times, the goal must be reached before it goes down to zero, while other times an area has to be defended until the counter reads zero. Upon finishing the tutorial, the Mercenary’s Guild serves as the game hub between missions. From the Guild, the player do things like going into missions, setting up contracts, purchasing items for use, or training. Members can be hired or dismissed for your mercenary team, and each potential member has a decent level of appearance customization. In addition to being able to customize appearance, base character stats can be bolstered to a degree as well. After setting up the little four person group, it’s off to complete missions! The art style and quality is amazing! Adding replayability to the game is the option to play offline or online with people. As an added bonus, there’s online crossplay between the PS4 and Vita! While I didn’t have much opportunity to be able to play online, it is fun to play as one of the four kingdoms and fight against another player defending theirs. The good thing about online functionality is that it’s not required to get though the game. In addition to online functionality, there are a few minor microtransactions which can change Squad Flags or the player’s battlefield set-piece. They aren’t obtrusive, and can add a little bit of flair. Visually, this game is absolutely amazing! It’s something that is pleasantly surprising, and all the special visual effects come though quite fluidly. My only real complaint though, is some of the text is quite small for the Vita’s screen and can be a bit hard to read. This mostly affects the abilities text in the lower left during battles. If this is played on a PS4, I’d imagine that this would really not be an issue at all. One other thing that can be hit or miss, but mostly spot on, is the voice acting. There’s a few spots here and there that sounds a little weak, but it’s a minor complaint. Game sounds and music really evokes the energy of battle during missions, and keeps things going without sounding repetitive. Grand Kingdom’s controls are very solid with moving around on the board, setting up attacks and executing them during battle. The translation work that was done is top-notch, and I didn’t see anything remotely Engrish during my playthrough. Overall, Grand Kingdom is easy and fun to get into. There’s the option to take small bits of time to work though a mission, or to go at it for hours at a time. It will take quite a while to play through, though so it’s something to keep in mind. Aside from the minor issues, Grand Kingdom is a very solid RPG and does it’s best to stand out as a tactical RPG. I would recommend getting this game for any RPG fan out there, as it’s worth it. Incidentally, for anyone looking to get a limited edition of this game, NIS America has the Grand Kingdom Grand Edition available for $99.99 USD for the Playstation 4. As expected from any special edition from NIS America, it comes with a number of things, including things like several posters, art prints, art book, and soundtrack. It’s well worth it for any collector. 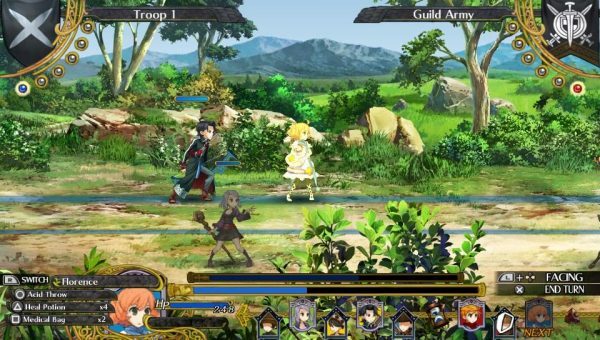 Grand Kingdom is now out for PlayStation 4 and PS Vita!